If the minority people of Tigray are looking to pin the blame for the border war and outcome of the Boundary Commission Decision on someone, they need to look no further than TPLF. For the residents of Badme, a desolate border town in the war-scarred badlands between Ethiopia and Eritrea, new Prime Minister Abiy Ahmed’s peace overtures to Asmara, are an insult to the living and the dead. Many of Badme’s 15,000 people are veterans of a 1998-2000 conflict that drew comparisons to the First World War, with waves of conscripts forced to march through minefields toward Eritrean trenches, where they were cut down by machine gun fire. Far from being an olive branch that might ease tensions between the two nations, locals said ceding Badme to Eritrea, which Abiy said Addis would finally do in accordance with a 2000 peace deal, is an act of betrayal. As he spoke, he gestured toward the entrance of the town and the spacious cemetery where dozens of tombs lie, marking the symbolic final resting place of the 50,000 Ethiopian rank-and-file who perished in the war. On the Eritrean side, 20,000 men are thought to have died. Despite Badme’s centrality to what was, on the surface at least, a border conflict, nobody in the town was told about Abiy’s plans. The first word Badme was to be ceded to Ethiopia’s bitter foe on the shores of the Red Sea came via state radio and television. “The thought of moving these bodies from where they were sacrificed is desecration of their honor,” said unemployed 35-year-old Habtom Shiferaw, whose family members fought in the war. Locals, he added, would not go quietly – a rare threat against the authority of the state in one of Africa’s most tightly controlled countries. “They should not expect peace here if they force us to leave,” he said. “There will be violence.” Others agreed. “We have no issues over reconciling with our Eritrean brothers. But we will not leave Badme. We do not want peace by giving away this land after all the sacrifice,” said Teklit Girmay, a local government official. In a worrying sign for Abiy, a 41-year-old who has embarked on a radical economic and political reform drive since taking over in March, anger is rippling beyond Badme across Tigray, the northeast region that borders Eritrea. Some Tigrayans, who have long been the leading ethnic group in the EPRDF coalition which has run the nation of 100 million for more than two decades, are concerned their interests will be hurt if Badme is surrendered. 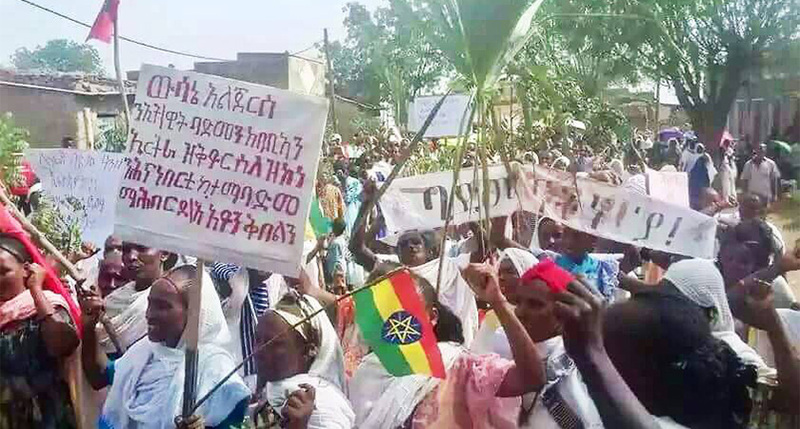 Residents told Reuters that a protest had already taken place in the Irob district in Tigray, and there are signs in the region of friction over the decision by Abiy, a member of the Oromo ethnic group, Ethiopia’s largest. Abiy was appointed after three years of unrelated unrest in the Oromo area but he needs the support of all members of the ruling coalition to push through sweeping changes including partial privatization of the national airline and telecoms firm. “The Tigrayan People’s Liberation Front will not take part in any process that harms the interests of the people of Tigray,” it said in a statement, demanding that any withdrawal is linked to additional concessions from Eritrea. Eritrea has long said it wants Ethiopia to pull its troops out from Badme before normalizing ties, citing a decision by a boundary commission at The Hague which awarded the town to Eritrea in 2002. Ethiopia’s government has said tens of thousands of troops are posted in the border outpost. When Reuters visited Badme on Friday, military trucks mounted with soldiers circulated through the town throughout the day. There are those who are today grumbling about PM Abiy’s announcement to implement the Decision. They angrily declare he committed an “act of treason”, a “historic blunder” and a “shameful act” by deciding to implement the Decision unconditionally. They say thousands of Ethiopians died defending the Ethiopian Eritrean border and the town of Badme and many more thousands ended up in exile as a result of the border war. They claim PM Abiy’s “dictatorial government” made its decision to implement the Decision without public debate, input, discussion and professional consultations. They made good on their threat to hold “large public meetings” and undertake “demonstrations” to show their displeasure and opposition to PM Abiy’s decision. Unfortunately, those who want to pin the blame on PM Abiy are barking up the wrong tree. 5) the rigid procedural rules of the arbitration proceeding. In the following analysis, I hope to temper the inflamed emotions and passions of those reacting negatively to PM Abiy’s decision by enlightening them on the tragic facts of the Boundary Commission Decision. On December 8, 2000, the House of Peoples’ Representatives issued Proclamation No. 225/2000 “ratifying the peace agreement” between Ethiopia and Eritrea. the mandate of the Commission to decide through binding arbitration all claims for loss, damage related to the conflict (art. 5(1)). Representing Ethiopia on the record before the Boundary Commission were Seyoum Mesfin, Fisseha Yimer and Seifeselassie Lemma, supported by legal team which included a retired Oxford University professor of international law and two American and two French lawyers. The Boundary Commission held hearings at the Peace Palace in The Hague from December 10-21, 2001. Representatives of the two countries presented their legal arguments and analysis of the evidence to the Commission. On April 14, 2002, Seyoum Mesfin declared, “Ethiopia accepts the ruling. Ethiopia is satisfied. We hope that the decision will once and for all seal any attempt by military adventurers to change the boundary by means of force.” Seyoum added, “This is a victory of peace over aggression and violence. It is a victory of law over the rule of the jungle.” Seyoum publicly declared that the town of Badme had been awarded to Ethiopia and accused “the Eritrean government of trying to cause ‘confusion’ by stating it had been awarded the village of Badme [which is] “an integral part of Ethiopian sovereign territory”. Let’s face the raw facts! If people are looking to pin the blame for the outcome of the Boundary Commission Decision on someone, they need to look no further than Meles Zenawi, Seyoum Mesfin, Fisseha Yimer and Seifeselassie Lemma. So, we must face the unavoidable question: What is the problem with PM Abiy Ahmed implementing a Decision accepted as a “victory” by Meles Zenawi and “satisfactory” by Seyoum Mesfin? Those who criticize PM Abiy for his decision to implement the Commission’s Decision should learn a lesson in the rule of international law. A party to a binding international legal proceeding does not have the luxury of accepting a decision only when the party likes the outcome or prevails. It is not possible to call international jurists and intimidate and threaten to fire or jail them if they do not do our bidding. We do not have the option of rejecting a binding arbitration decision because we reject the outcome could get us into the political hot water. It is ironic that Seyoum Mesfin should describe the Commission’s Decision as “a victory of peace over aggression and violence. It is a victory of law over the rule of the jungle.” That is an extraordinary statement coming from someone who has lived all his life by the rule of the jungle.